Choose 1 or more style here. 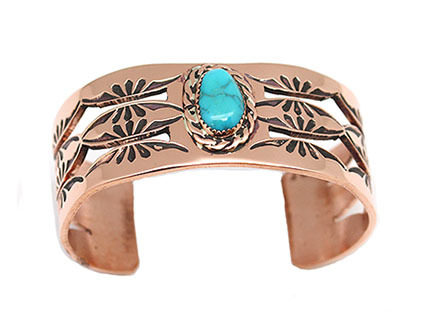 Good weight copper with two rows of cut out shank with stamping and one free form turquoise stone with twist wire border. It measures approximately 1 1/8" wide at widest. It is Navajo hand made by Darrell Platero. Also available with one cut out down the center of shank. Turquoise stone will vary in shape and stamping will vary as well. Choose 2 or 1 cut out shank when ordering.